I’m delighted to welcome this week’s guest blogger, Richard Endsor. Richard is acknowledged as the leading authority on the design and construction of later Stuart warships, and is the author of the seminal book The Restoration Warship, which focuses on the Lenox, the first of the ‘thirty new ships’ built under the auspices of King Charles II and Samuel Pepys. Unsurprisingly, Richard is heavily involved with the project to build a replica of the Lenox on the historic dockyard site at Deptford, and he has also been actively involved in the work on the wreck of Lenox‘s sister ship, the Anne, at Pett Level near Hastings. Richard, who serves as the technical historian for the team working on the Anne, has chosen to blog about an intriguing discovery relating to the ship, so I’m delighted to hand the cyber-floor over to him! The Anne was built at Chatham Dockyard by the well known Master Shipwright, Phineas Pett, and launched on 7 November 1678. She was part of the great thirty ship building programme organised by Samuel Pepys on behalf of King Charles II. 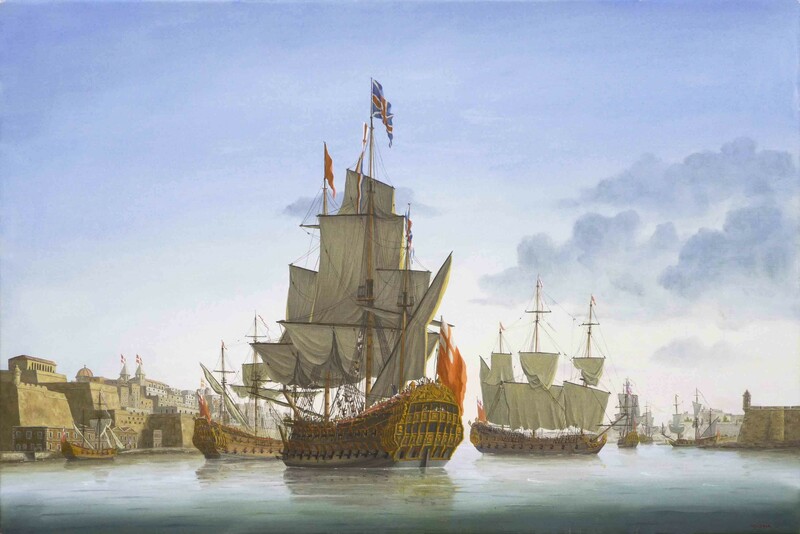 The story of her loss begins in early 1690 when the French fitted out a large fleet to enter the English Channel to pave the way for an invasion. To oppose them, the English and their Dutch allies prepared their own fleet which included the Anne. In March 1690, as her guns were made ready for war at Chatham, Stephen Bassett of the smack Stephen and Anne brought her gunpowder and some shot down to her from the Tower of London. At the same time, John Berry was employed drilling, clearing some of the vents of the guns which were cloyed up with stones. He would have found many of the gun carriages rather posh, as three years before those in the gunroom had been painted in veined white while the rest were wainscot coloured. They were decorated like this for the occasion when she was employed to transport a German princess to Portugal followed by a cruise in the Mediterranean. Her allocation of guns was not altered during her career and was last recorded less than five months before her loss. The French met the smaller combined fleet of English and Dutch ships off Beachy Head on 30 June, and although the allies suffered a defeat, they prevented an invasion. The Anne became the only English casualty in the battle when she was dismasted and run ashore at Pett Level. 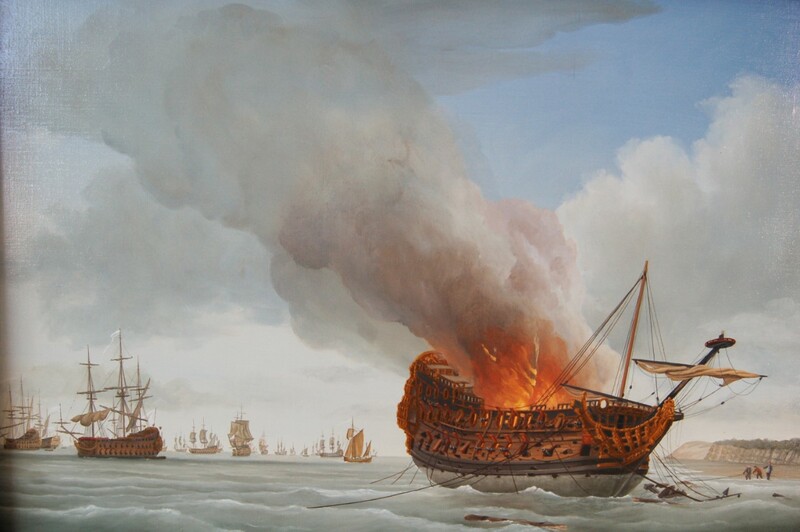 With the French closing in and the possibility she would be captured, the Anne was burnt on 5 July destroying all her structure above the water, all that is except her ironwork and ironwork was an expensive commodity in the seventeenth century especially when most of it came in the form 70 guns weighing 120 tons. Although the guns were lying in the wreckage of the burnt out ship, the temperature of the wood fire would not be expected to damage them. Guns were not directly the responsibility of the Admiralty but of another body, the Board of Ordnance, and five days after the fire Robert Bennett, their Purveyor, went to Rye to make arrangements to save as much from the Anne that could be saved. He made two visits during 1690, staying until the end of July and returning again for another two weeks in September. During his time there he employed Robert Jefferson with nine men and Robert Robinson to save what shot they could from the wreck at low water. He also hired Jacob Hall’s boat and two men to bring the shot and other stores from the Anne, while the wet and dirty job of putting the shot into the boat was done by John Kirby. Once ashore, William Yeames carried some of the smaller guns and shot in wagons to Winchelsea and Rye while John Hall’s “great boat” was used to take stores to Winchelsea nearly three miles away to the east in the direction of Rye. For security Robert Browne and three men then carried arms, in the form of muskets, pistols, swords, pikes and the like into the Church Hall from several other places. Two warrant officers from the Anne were involved; Thomas Adams the Gunner and his men spent three days helping the Purveyor sort out the stores while Richard Penny, the Carpenter, stayed at Rye until the end of July helping William Yeames make a list of the goods he was holding, presumably on behalf of the Navy. Judging by the relatively small sums of money involved in these operations, it is unlikely any of the 2 ½ ton Demi Cannon and 1 ½ ton 12 Pounders was removed from the wreck. Nevertheless, the ordnance that had been saved now needed bringing back to London, and William Reed of the Charity Hoy was paid seven pounds at ten shillings a ton for bringing guns, round shot and small arms from Rye harbour to Woolwich and the Tower. A similar task was also undertaken by Robert Bennet. On 1 August John Packman was paid for moving four of the Anne’s guns from the “crane”. These guns were all under 1 ½ tons indicating they were probably Anne’s smaller Sakers or 3 Pounders. The official recovery operation would seem to have ended during October as the cold weather closed in. This did not seem to affect the local “country people” who, it was reported “do take all opportunity of pulling her to pieces and carrying away what may be of any use or value to them” Rather than employ people themselves to break her up and recover worthwhile timbers from the ship the Navy Board wrote to the Admiralty saying they thought it better to sell the wreck to someone else for that they may save the heavy timbers such as futtocks, floor timbers, floor riders, keel and keelson pieces, thick stuff and four inch plank not cleft or defaced by fire and to deliver the same into their Majesties stores at Chatham and Portsmouth as we shall direct at 40 pence per load. They treated with a shipwright, Joseph Bingham who employed himself in such affairs and agreed to let him have her for twenty pounds. However, all the timbers mentioned in the proposal remain in the ship to this day and no record has been found to show the agreement was ever carried out. Bingham’s will of 1709 also make no mention of the Anne, making it safe to assume she was not sold. Records do show that he delivered a good quantity of timber to Plymouth Dockyard in 1698 and that in later life he lived in Plymouth with his wife, Ann, and four children. After 1690 the Navy seems to have had no further interest in the wreck, although she remained the property of the Crown. The sale of the Anne to Bingham for £20 may well have collapsed because most of her guns were still within her remains and were worth about £2200. They belonged to the Ordnance Board, and although the Navy lost interest the Ordnance Board certainly did not and soon made arrangements with the handy Joseph Bingham to recover the guns the following summer. He mounted a serious and professional operation, first laying skids to roll the guns up the beach then hiring teams of horses to pull them. A log resting alongside the port bow today may be part of the skid. He also bought new cordage and built a shed, presumably to store his equipment and provide for the men. He signed a contract 9 June 1691 to receive fifty shillings for every ton of guns recovered once certified by the Mayor of Winchelsea. Surviving bills show that on one occasion he recovered nine guns weighing in total 23 tons 6 hundredweight making the average weight of each gun 51 ¾ hundredweight which was the weight of her largest guns, the 9 ½ foot long Demi Cannon. Although the heat of the fire could not reach the melting point of iron, it may have caused some distortion, especially if the guns had fallen some distance – perhaps hitting each other as the Anne disintegrated. With the recovery operation successfully underway it was decided to proof test the guns at Winchelsea. To transport at least 15 of the guns, the byways for land carriage were mended. They weren’t the only guns taken as a further 27 tons of ordnance were moved from the wreck site to Winchelsea by Richard Thomas and John Chrenlow. George Potter, Master of the Bachelors Hoy, brought the necessary gunners stores for proof testing from the Tower of London to Rye. The shot and powder was brought the final two miles from Rye to Winchelsea by William Beats in his boat and a wagon hired to move stores and hay for wadding from the quay at Winchelsea. The proof firing itself was carried out by Captain Tokey’s men under the direction of Ordnance Officers Silvester and Hooper. Tents and their furniture were brought to the site from Tunbridge by John Slade, the Board’s Labourer and he stayed on site to help prove the guns. On its return to the Thames, the Bachelors Hoy took the gunner’s stores and small arms to the Tower and Anne’s proved ordnance to Woolwich. The re-proved guns would have entered the lists of spare guns waiting to be issued to other ships. 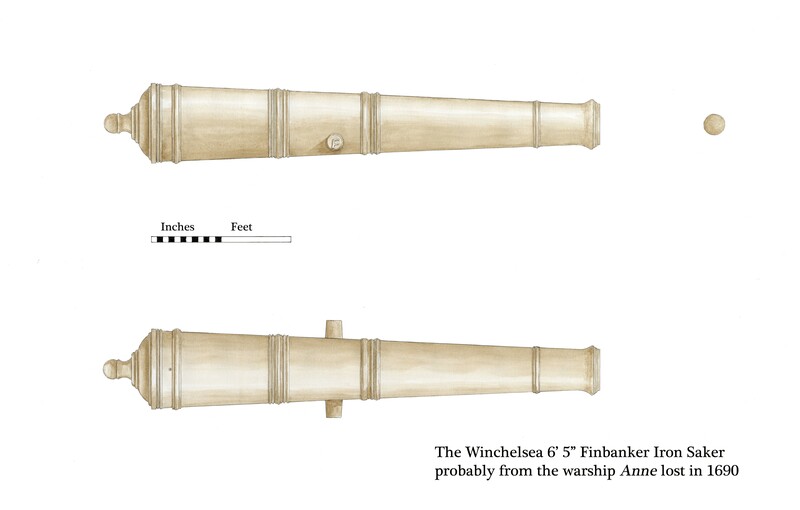 There seems to be no record surviving of guns that failed the proof testing at Winchelsea but any condemned large guns would probably been sent back to gun founders for re-casting. Recently a gun was seen at the Winchelsea Museum by Jacqui Stanford, local resident and Chair of the Shipwreck Museum, Hastings and English Heritage-appointed Licensee of the Anne. The Shipwreck Museum has a particular interest as it is the owner of the Anne, and as the gun was clearly very old and reportedly found locally she raised the interest of historians interested in the ship. In March 2010 it was examined by the respected independent gun expert, Charles Trollope. He identified the gun as an iron Saker of 77 inches long with the remains of an “F” cast on the end of the right trunnion identifying it as being cast at the Finspong foundry in Sweden in the middle of the seventeenth century. No other markings are now visible. He added that the guns were given the generic name “Finbankers” and were of high quality. When captured from the Dutch they were reamed out to English bore sizes, in this case 3 ½” then proof tested and issued to English ships. The button is missing at the rear and the outside surface shows evidence that it had been buried upright at a depth of about five feet. Some groves are visible in the bore suggesting an iron spike had been inserted to act as a fulcrum for a pivot gun as part of a traversing platform in a battery suggesting it may have been part of the canal defence system introduced in the 1790’s. Charles points out that a possible site for the gun would have been the battery constructed in the 1790’s at Winchelsea Beach where Rye New Harbour used to reach the sea. It would have been redundant with the completion of the Royal Military Canal and Martello Towers and removed by the landowners in about 1840. When the battery was constructed it was the local engineer’s responsibility to find a solid pivot for the guns and the likelihood is that he used an old gun that had failed proof at Winchelsea 100 years before. Although the gun is not exactly the length given in the Anne’s 1690 gun list, it is certainly near enough to qualify as one of her twelve seven foot long Sakers. Ten of these were mounted on the quarterdeck and the remaining two on the forecastle. The button may have been lost in 1690 and was the reason for its rejection or removed at the time the battery was constructed. Although it is not possible to say the gun was definitely from the Anne, it is highly likely. I wish to thank Jacqui Stanford, Chair of the Nautical Museums Trust for bringing the gun to our attention, Charles Trollope for his expert opinion of the gun and its usage, Dr Peter LeFevre, the Historian for the Warship Anne Trust, for his immense support and finally Major John Freeman and Melvyn Pett of the Winchelsea Museum for allowing me to record the gun.